The College of Winterhold is a faction that you have the option of joining. It is Skyrim's equivalent of the Mages Guild from earlier Elder Scrolls games. The College is the only place in Skyrim dedicated to education and practice in the magical arts. The secretive nature of the College mages and the Nords' natural distrust of Magic have contributed to widespread distrust of the College and its members. 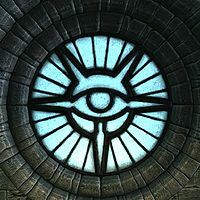 The destruction of most of Winterhold in 4E 122 only worsened the situation, though no actual evidence exists to suggest the College's involvement. The College's leader, Arch-Mage Savos Aren, seems to be aware of the College's reputation, but doesn't seem too eager to do anything about it. The threadbare Hold City of Winterhold has seen most of its population driven away. The center of life in these parts nowadays is the College of Winterhold. Once a prominent, influential location in Skyrim, Winterhold has fallen on hard times, but is still a haven for mages in Skyrim, a safe refuge from distrustful Nords. Largely self-sufficient, the College of Winterhold is quite content to be isolated from the rest of the province, although a more peaceful coexistence with the outside world is always preferred. The College of Winterhold is situated on a cliff overlooking the Sea of Ghosts. Several years ago, much of the cliff fell into the sea, taking nearly all of the original city with it. Only a few buildings remain, though somehow the College of Winterhold has largely been untouched by the damage. It now resides on a free-standing pillar of rock and ice. Inside, the College is split into three distinctive towers: Halls of Countenance and Attainment, where apprentices and senior mages reside; and the Hall of the Elements, where the Arch-Mage resides, gatherings are held, and The Arcanaeum (the College's great library) is kept. Below the College lies The Midden, a warren of icy tunnels where the remnants of long-forgotten experiments reside. To join the College of Winterhold, you must first travel to Winterhold. The first quest is a "gatekeeper" of sorts, called First Lessons. Master-level trainers in Illusion, Destruction and Alteration. Expert-level trainers in Enchanting, Conjuration and Restoration. Access to alchemy supplies, as well as an alchemy lab and an arcane enchanter. Access to shopkeepers that sell various spell tomes. Access to various skill books. A free bed to sleep in. Under Saarthal and The Staff of Magnus need to be started to gain access to word walls for Ice Form and Slow Time shouts, respectively. Committing a major crime against a College of Winterhold member, such as assault or murder, will trigger the Rejoining the College quest. You will be required to pay a fine to Tolfdir in order to be reinstated. Once the quest line is complete, you are granted the position of Arch-Mage, replacing the now-deceased Arch-Mage Savos Aren. This gives you possession of the Arch-Mage's Quarters and a vast number of free items, ranging from soul gems to alchemy ingredients. You are also given the Archmage's Robes (15% less magicka cost on all spell schools, +50 Magicka and 100% faster magicka regeneration). 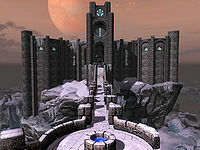 The primary College of Winterhold questline consists of nine quests. Three achievements (50 points; 2 Bronze and 1 Silver) are unlocked by the College's quests. College Objective Quest: Visit the College of Winterhold. Rejoining the College: Make amends for breaking the College of Winterhold rules. Restocking Soul Gems: Help Sergius Turrianus to fill his stock with soul gems. Three optional quests for the College are not implemented and are only visible using the console. They are "Research Thief", "The Missing Apprentices", and "Rogue Wizard". These are not College of Winterhold quests. However, it is impossible to complete them normally without joining the College. Esta página foi modificada pela última vez à(s) 23h49min de 14 de junho de 2015.